Your ability to develop a deeper connection with customers and prospects depends heavily on your ability to provide value. In many cases, the best way to provide that value is to educate them on important aspects of your product, industry or company. Email is an essential tool for nurturing customers. Companies that excel at lead nurturing are able to generate 55% more sales-ready leads at a 33% lower cost. Your ability to develop a deeper connection with customers and prospects depends heavily on your ability to provide value. In many cases, the best way to provide that value is to educate them on important aspects of your product, industry or company. Delivering consistent value through email plays a key role in the lead nurturing process. Being able to identify which subjects your customers are most interested in hearing about and delivering educational materials on those subjects can be a great way to position your company as a source of information and establish thought leadership within your industry. In this article, we’ll look at some examples of excellent educational emails that do a great job of providing information and establishing authority with their audience. While every company has a need to educate customers, understanding how to go about it in the right way is critical for making that connection. Identifying not just what your customers want to hear about, but when they want to hear about it is imperative. When a customer first begins using your product, you have an obligation to help them get as much value out of it as they can. This is not only because it is in the best interest of both the customer and your own company to ensure they find your solution valuable - it’s also just the right thing to do. Salesforce does an excellent job of directing users toward resources they might find useful shortly after they first sign up for the service. In this example, they get a few different educational resources in front of their subscribers including an expert community to help people connect with the software, developers connect with developer resources, and demos for new users. This kind of roundup of resources can be a great introduction to a new customer and give them the resources that they need to guide themselves through the early going of learning how to use your software. On a creative level, they do a great job of capturing attention with headlines and attractive images. While they haven’t published any information about how this campaign has performed for them, you can bet that it has helped them to educate their new customers and establish deeper relationships. Treehouse is a company that offers programming and coding courses in a wide variety of different languages. One of the big hurdles that they have is helping their customers to understand all of the value that they will derive from each individual course that they go through. In this example, Treehouse breaks down a course for building a WordPress.com website, providing users with a project description and an overview of the individual sections of the course. This email is great because it fully explains the value of the course and helps customers gain insight into how the course will help them. While this is a free course, Treehouse offers similar email sequences to customers that express interest in some of their paid offerings as well. Design-wise, this is a great educational email. It’s pleasing to the eyes and provides a great overview of the course without becoming too long or taking up too much space. Overall, the sequence is a solid one that gives customers a taste of the type of offerings that they provide without asking too much of them. Framebridge sells art frames and other related accessories. As an e-commerce company, one of the best types of educational content that you can provide to your users is guides on how to use your product and get the most value out of it. Since they sell art frames, teaching users how to use their frames to hang their artwork and photos in an aesthetically pleasing way. In this email, the company provides a simple step-by-step breakdown of how to go about hanging art and then invites them to click a button to learn more about the process. It’s simple, but effective. Many of their customers could learn something from this sequence, even if it is something small. Framebridge does a great job of providing some simple, email-friendly instructions but also inviting readers to click more for more information. The three steps that they provide in the email are designed to convince the customer to inquire further to satisfy more specific questions about the process of hanging art. Sephora, one of the largest cosmetic and beauty companies in the world, knows that they have an obligation to teach their customers how to get the most out of their products. You can offer the best makeup in the world, but if your customers don’t know how to apply it correctly, your quality won’t stand out from the competition. 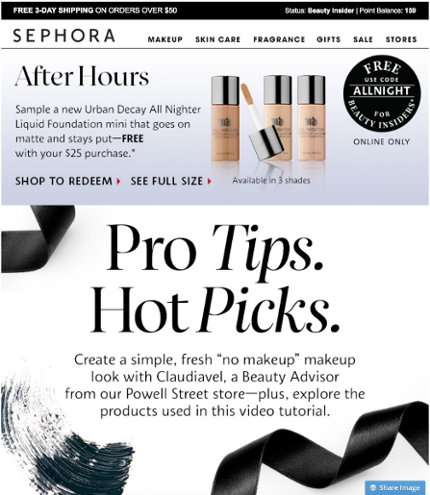 In this example of an excellent educational email, Sephora sends their users a video tutorial that teaches them how to achieve a specific look with their makeup, while promoting a new line that is used throughout the video tutorial. They also link directly to a page that includes all of the products from the tutorial. One of the biggest issues that small companies have when it comes to creative projects is finding the right mix of talent among the people that they work with. Small companies often don’t have the budget to bring experts in full-time, and instead, have to rely on stringing together full creative projects from multiple freelancers until they can complete the project. In this email sequence, freelancer helps to paint the picture of how their platform can be used to build a team of talented creatives for a fraction of the price that it would cost to hire full-time employees. Sometimes, educating customers is as much about informing them about your product and services as it is diving into tangentially related topics. Great educational emails are all about nurturing and relationship building. Whether you are delivering educational emails to long-time customers, new customers or interested prospects, they provide you with the ability to establish your company as an authority and develop deeper connections with your audience. The examples in this email show a range of strategies executed effectively and should provide some inspiration for your own campaigns. What’s the Difference Between a Personal Mailbox and an Email Service Provider?